timotheegiet committed R924:36bc030c7313: fix Linux to GNU/Linux (authored by timotheegiet). timotheegiet committed R2:c7ca4bafb13c: core, remove extra space preventing finding the language name Malayalam for the… (authored by jjazeix). 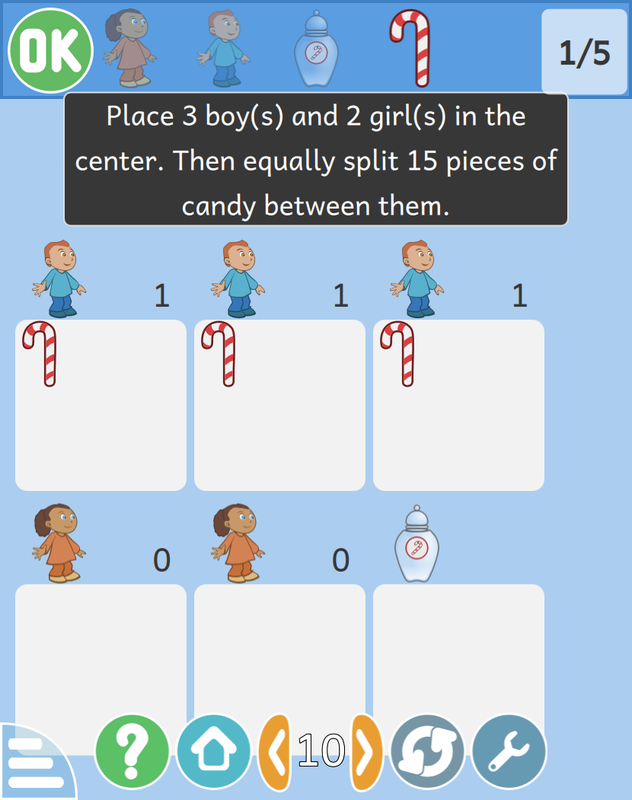 timotheegiet added a comment to T10094: improve Share Pieces of Candy goal message display. Yes I did read that comment, but still it's a bad design idea to mix half transparent text with the area to interact with, it doesn't look really good. Also we can easily have space in the bar with items to drag for that new button. Actually this is not a good plan in my opinion, as in some levels we need to place several boys and girls, and it will not fit anymore in the area. I propose a better plan: keep current behavior (hide the instructions when dragging items), but also add an explicit button to display again the instructions on top of placed items in the area. (for this button, you can use any temporary icon, I'll make a good one when the patch is accepted). timotheegiet committed R2:d333aeecb537: menu, fix warning when closing configuration page (authored by timotheegiet). timotheegiet closed T1498: Find a way to have less distortion in images in portait mode in the click_and_draw activity as Resolved. This is all fixed now, closing as Resolved. timotheegiet closed T5737: Scrollbars / buttons to navigate in the menus as Resolved. This can actully be closed as fixed. timotheegiet added a comment to T7716: Help integrate Malayalam changes. timotheegiet committed R924:25201cd6c953: fix typo (authored by timotheegiet). timotheegiet committed R924:a04b6415ff79: fix typo (authored by timotheegiet). timotheegiet committed R924:54b70bbbc5be: font NotoSansMalayalam woff and woff2 conversions (authored by timotheegiet). timotheegiet committed R924:c7c8157fc5d8: add Noto Sans Malayalam for ml version (authored by timotheegiet). timotheegiet committed R924:dae38e9f3c22: fix 2 strings of previous commit (authored by timotheegiet). timotheegiet committed R924:8c2e0c35673f: add translated news 20190303-ml (authored by timotheegiet). timotheegiet committed R2:7710e406c887: gletters, add ml dataset (authored by Aiswarya Kaitheri Kandoth <aiswaryakk29@gmail.com>). timotheegiet committed R924:2c85a7527d8c: fix a string (authored by timotheegiet). timotheegiet committed R862:f02c73f67acf: ml add a few missing words (authored by timotheegiet). timotheegiet committed R862:46b3c516cab9: update LICENSE file (authored by timotheegiet). timotheegiet committed R862:48fd7ab298bc: add Malayalam voices (authored by timotheegiet). timotheegiet committed R862:746a643cdb3d: add comment in a script (authored by timotheegiet). timotheegiet committed R924:77e55ce18d0f: fix untranslated string (authored by timotheegiet). timotheegiet committed R924:5338b753cf72: add translated news 20190303-de (authored by timotheegiet). timotheegiet closed T10093: Improve division rest icon in Share Pieces of Candy as Resolved. timotheegiet committed R2:646ee865a3ba: share, use mipmap on images (authored by timotheegiet). timotheegiet committed R2:416b267b30f9: share, update basket icon, plus some svg cleaning (authored by timotheegiet). timotheegiet committed R2:a9fb0af1bec6: share, fix colors (authored by timotheegiet). timotheegiet committed R2:75cb1454243c: share, fix layout and images scaling (authored by timotheegiet). timotheegiet committed R924:d2bc00dd00d4: update buy page template (authored by timotheegiet). timotheegiet committed R924:20ceb8e03d00: add translated news 20190303-pt (authored by timotheegiet). timotheegiet added a comment to T10740: Digital Electricity, enhance device connectivity . I fully agree on points 1 and 2, those should be done. timotheegiet committed R924:9ff89846370a: fix all news images size for phone screens (authored by timotheegiet). timotheegiet committed R924:1855e8383bb9: fix screenshots size on mobile (authored by timotheegiet). timotheegiet committed R924:45a57dcb3184: fix size issues on main page for phone screens (authored by timotheegiet). timotheegiet added a comment to T1528: Port of Gtk+ Place your satellite. -increasing the size of something doesn't directly means increasing its mass (if you stretch something, it will take more space but have the same mass), that can lead to bad misconception for kids. -increasing the size of a planet sounds very weird to me, as it's not realistic at all. timotheegiet closed T10051: improve layout of piano_composition as Resolved. Sorry, actually I this task is a left-over that I forgot to close after fixing the layout of this activity. The current number of buttons is intended, and increase at each level to introduce new functionalities progressively. As we don't want to remove features, I'm closing it now. timotheegiet closed T10051: improve layout of piano_composition, a subtask of T1521: Port of Gtk+ piano composition, as Resolved. timotheegiet committed R924:5863dccbea00: english fix (authored by timotheegiet). timotheegiet committed R924:f81d1e12de61: little layout fix (authored by timotheegiet). timotheegiet committed R924:cdcd68df0779: add note about OpenSSL for packagers (authored by timotheegiet). timotheegiet committed R924:55d523176ba6: replace MacOSX and OSX by macOS (authored by timotheegiet). timotheegiet committed R924:b2dde42cc89c: add translated news 20190122-pt_BR.html (authored by timotheegiet). timotheegiet committed R924:1db3c15e2107: new release 0.96 (authored by timotheegiet). timotheegiet added a comment to R2:c80984653fe1: osx, disable fullscreen default. Sure you're right :) I was not sure if using that kind of #if was allowed inside this context, that's why I defined a variable for it. We can change like that in master. timotheegiet committed R2:c80984653fe1: osx, disable fullscreen default (authored by timotheegiet). timotheegiet committed R2:3078b2f7568d: osx, disable fullscreen default (authored by timotheegiet). timotheegiet committed R2:9f2d1ef95dd8: linux and windows, missing parenthesis (authored by jjazeix). timotheegiet committed R2:b427100412d4: linux and windows, always use find_package for openssl (authored by timotheegiet). timotheegiet committed R2:682097d58e89: android, comments cleanup (authored by timotheegiet). timotheegiet committed R2:4312c7f936a6: android, fix script (authored by timotheegiet). timotheegiet committed R2:11ec30ff378b: android, update build script (authored by timotheegiet). timotheegiet committed R2:85a138336ea2: tools, update script url (authored by timotheegiet). timotheegiet committed R2:19c1e22bedc5: android, no-asm needed for clang (authored by jjazeix). timotheegiet committed R2:e113ad1eeea6: android, force api at 16 minimum (authored by jjazeix). timotheegiet committed R2:7ec422f841da: linux, add OpenSSL in standalone package (authored by timotheegiet). timotheegiet committed R2:a638daf19f55: android, begin build with clang of openssl (authored by jjazeix). timotheegiet committed R2:c7c86049216c: android, build openssl from source. Works only yet with Qt < 5.12 (gcc, not… (authored by jjazeix). timotheegiet committed R2:cb392decba8a: core, set server protocol to https instead of http to download data (authored by jjazeix). timotheegiet committed R2:866de416c9e2: openssl, add dll in package (authored by jjazeix). timotheegiet committed R2:7f0fa9276cdc: appveyor, (authored by jjazeix). timotheegiet committed R2:a5108c885acd: appveyor, bump to vs2017 and Qt5.12.1 (authored by jjazeix). timotheegiet committed R2:b02283e3e202: android, drop support of x86 (we don't publish them since a long time, there is… (authored by jjazeix). timotheegiet committed R2:77e0998504fe: android, add _HOST cmake variable that was removed from ECM (authored by jjazeix). timotheegiet committed R2:33d8a5447d71: android, restore some previously removed include/changes from ECM to create the… (authored by jjazeix). timotheegiet committed R2:92b42425cad0: core, add OpenSSL in windows package (authored by timotheegiet). timotheegiet committed R2:7f7629e2131f: cmake, T10432: disable activities using box2d at runtime if box2d not present… (authored by jjazeix). timotheegiet committed R2:365abd5ff4b6: tests, add test for ApplicationInfo.getAudioFilePathForLocale() and… (authored by jjazeix). timotheegiet committed R2:926b87fc6f53: tests, add ApplicationInfoTest (authored by blaws). timotheegiet committed R2:f3450e7bb331: linux and windows, always use find_package for openssl (authored by timotheegiet). timotheegiet committed R2:7de587f48161: android, fix script (authored by timotheegiet). timotheegiet committed R2:b4beabf4d95a: android, comments cleanup (authored by timotheegiet). timotheegiet committed R2:7a96d05f49fd: tools, update script url (authored by timotheegiet). timotheegiet committed R2:13a2ac744e60: android, update build script (authored by timotheegiet). timotheegiet committed R2:70a5c30a8b71: linux, add OpenSSL in standalone package (authored by timotheegiet). timotheegiet committed R2:9dc69b13cc07: core, add OpenSSL in windows package (authored by timotheegiet). timotheegiet accepted D19245: leftright activity layout issues fixed. It is true that the overlapping was not really a problem. But since your change doesn't have any bad side effect I'm ok to get it merged. Also I'll refactor the graphics and layout of this activity at some point later anyway, so this little patch is good for now. timotheegiet committed R2:d4bfc2812004: tools, add commented workaround in case of too fast animations (authored by timotheegiet). timotheegiet committed R2:faaf47e722c2: tools, add commented workaround in case of too fast animations (authored by timotheegiet). timotheegiet committed R924:82bec99d55dc: add translated news 20190122-gl (authored by timotheegiet). timotheegiet created T10410: Use QtQuickCompiler to compile qml and js at build time. timotheegiet added a comment to T10211: Multiple Dataset Design . timotheegiet committed R2:1dc7900ba8b7: algorithm, in Qt5.12, the elements were not displayed (https://bugreports.qt. (authored by jjazeix). algorithm, in Qt5.12, the elements were not displayed (https://bugreports.qt. timotheegiet committed R2:6733f6004b90: checkers, in Qt5.12, collision between the reset functions and between the turn… (authored by jjazeix). timotheegiet committed R2:50f3bb742faf: GCCreationHandler, add missing Ok buttons (authored by timotheegiet). timotheegiet committed R2:3ca38dfa6eb9: memory, fix typo (authored by jjazeix). timotheegiet committed R2:eb7dad3eb9cc: gnumch, remove space before ! (authored by jjazeix). gnumch, remove space before ! timotheegiet committed R2:706eac2462f8: cmake, fixes for mac build (authored by timotheegiet). timotheegiet committed R2:8c9279107b5e: renewable energy, no space before :. other, coding style (authored by jjazeix). timotheegiet committed R2:81c1989bca19: letter_in_word, add manual (authored by dekumar). timotheegiet committed R2:cff15ccb0f65: piano_composition, update instruction to emphasis it's the sharp notes that… (authored by jjazeix). timotheegiet committed R2:1da11cb75ee0: multiple activities, fix typos/informations in strings reported by Federico (authored by jjazeix). timotheegiet committed R2:25e2db7457da: piano_activities, replace b with ♭, # with ♯ and add missing translator… (authored by jjazeix). timotheegiet committed R2:ccbdbf0815a3: core, fix tutorial loader enability (authored by jjazeix). timotheegiet committed R2:3a0da507bf0c: play_piano, maze, remove unused import of QtMultimedia (authored by jjazeix). timotheegiet committed R2:66539dadc246: piano_composition, 'whiteKey not found' fixed when octave has less than 7 keys (authored by amankumargupta). timotheegiet committed R2:a5104d431907: activities, fix multiple typos (authored by jjazeix). timotheegiet committed R2:7acc80324016: braille_alphabets, in Qt5.12, the braille map was not displayed (https… (authored by jjazeix). timotheegiet committed R2:6ce0dd922048: louis_braille, in Qt5.12, the LOUIS BRAILLE was not displayed (https… (authored by jjazeix). timotheegiet added a comment to T8576: Improve Brush Opacity handling..